Louis Riel is probably one of the most controversial figures in Canadian history, and depending on your point of view, he is often considered either a traitor or a patriot.. He was a political leader of the Métis people in Canada and is often referred to as the founder of Manitoba. After leading a rebellion against the Canadian government in 1885, Louis Riel was hanged for treason in what is probably the most famous trial in Canada. The Métis are a mixed race group of people who descend from First Nation people and European settlers, and are recognized as one of Canada’s aboriginal peoples. Louis Riel was a Francophone whose paternal grandfather was a voyageur who married a French-Chipewyan Métis. In 1885, Louis Riel led an armed uprising of the Métis people against the Canadian government in what became known as the North-West Rebellion. They believed the Canadian government had failed to protect many of their rights. Although the Métis initially won a few of the early battles, they eventually lost the war at the Battle of Batoche. A few day later, Louis Riel surrender to the authorities and was tried and hanged for treason. Louis Riel’s death had lasting political ramifications and helped to galvanize French-Canadian nationalistic opposition to the Canadian government that continues even to this day. 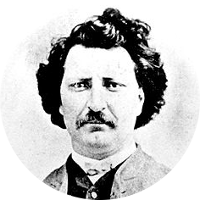 Louis Riel’s famous kin include the 15th Prime Minister of Canada Pierre Trudeau, and his son Justin Trudeau, the 23rd Prime Minister of Canada. He also has a number of celebrities in his family tree including singer and songwriter Madonna, actor Chris Pratt, Dancing with the Stars’ Julianne and Derek Hough, actor Dax Shepard, singer and songwriter Justin Bieber, and actors Mark and Donnie Wahlberg.